Above: Mt. 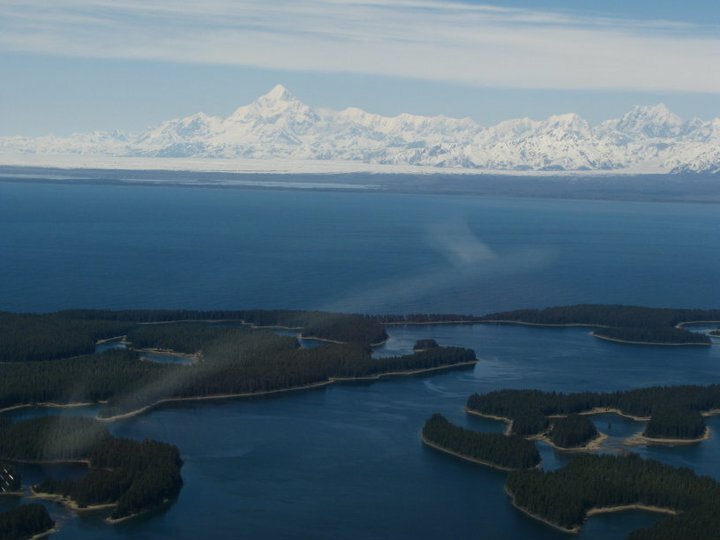 St. Elias and Yakutat Bay. Of all the places I visited during my two years living and working in Southeast, one of the most uniquely Alaskan feeling was Yakutat. Most of Southeast, to me, felt like it’s own special world, not really Alaska as it’s stereotyped, and not like anything in the lower 48 either. It had more in common with coastal British Columbia than mainland Alaska, and even then it still had much about it that you won’t find anywhere else. Yakutat felt different to me, like a strange mash-up of interior Alaska and Southeast. For starters, it was flat, swampy, with silty, ice-filled rivers running from glaciers and lakes with icebergs the size of houses at the edges of the mountains that defined the limits of the Yakutat Forelands. Brown bears the size of Mini Coopers roamed the sandy beaches and grassy bogs, and weren’t afraid to wander into town either. The first time I went to Yakutat for a project, the big story was that there had been three bears shot in town in the weeks prior. An image that sticks in my mind is of a dad walking down a dirt road in a neighborhood, pulling his young son behind him in a little red wagon, a beagle-looking dog running beside him, carrying a lever-action Marlin .45-70. You just don’t see that in most places, and it was a reminder that even in the modern age we’re not always at the top of the food chain. 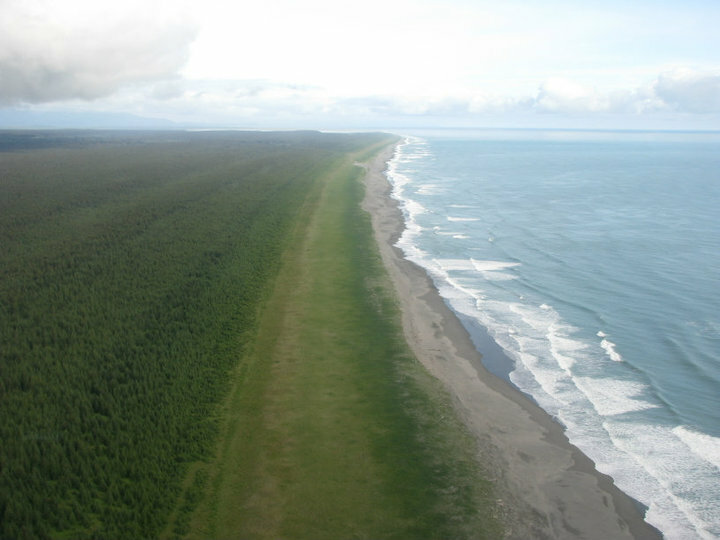 Above: Sandy coastline south of Yakutat. Another thing that made it feel special was the sandy beaches, and the surf. Unlike any other place that I saw in Southeast, the coastline there was made up of huge stretches of some of the most amazing beaches you’ve ever seen, exposed to the open ocean. Ignore the icy water, giant spruce trees, bear tracks as big as dinner plates, and the fishing camps scattered at random along the rivers and coves, and you could imagine you were in southern California. And like California, there were surfers. Not many, perhaps, and of a hardier constitution than their southern brethren, but surfers nonetheless. Often you’d park at one of the small grocery stores, and walk in past a battered pickup with crab pots, a beat-up chainsaw, and surfboards in the back. There’s even an honest-to-God garage-based surf shop, Icy Waves, where you can buy shirts proclaiming Yakutat as the “Far North Shore,” and get your surfing needs taken care of. It’s iconic enough that Alaskan Brewing Company has an IPA logo that features a surfer riding a wave in Yakutat Bay with Mt. St. Elias in the background. Like most of Southeast, Yakutat was difficult to get to, even by air. To get there from Juneau via helicopter was an hour and a half flight, either going up and over Glacier Bay NP on sunny days, or flying along the coastline around Cape Spencer if the clouds were too low to fly over the Fairweather Range. 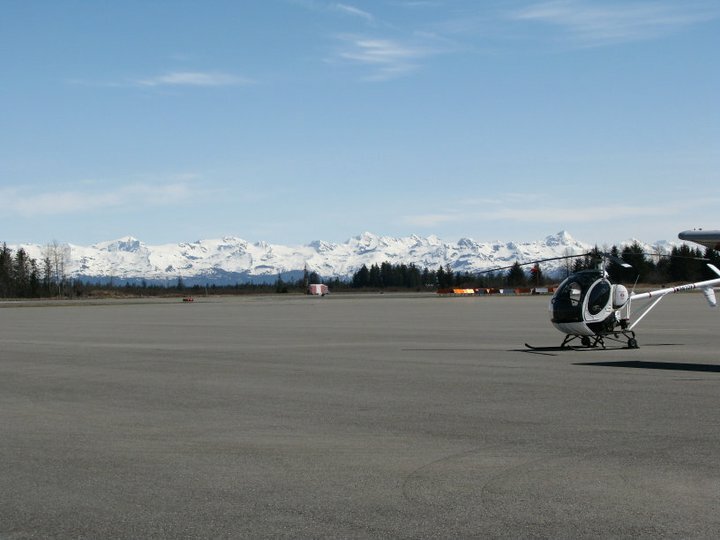 Yakutat had a small airport with a large runway, serviced twice a day by Alaska Airlines. There were two small air taxi and bush pilot companies, and a smattering of private planes. Unlike most of the airplanes farther south, these were all wheeled, and there were lots of places to land on the sandy beaches. There were a few roads, but nothing that connected to the outside world. Even the Alaska Marine Highway ferries only visit once a week or so in the summer. With a population of around 600, it had a remote, out in the bush feel to it. ATVs were as common as cars, and trail systems snaked through the swamps and Devil’s Club thickets growing under the canopy of massive spruce trees. There was no cell service, a few small grocery stores, a few restaurants catering to the fishing and sight-seeing crowd, a tiny Park Service Ranger Station for Glacier Bay and Wrangell-St. Elias National Parks, and of course, the Forest Service Ranger Station, located on the second floor of the medical clinic and Tribal Health center. It rains a lot there, and I’m told that in the winter it snows a lot as well. My first clue that it was still part of the temperate rainforest was when I hopped into a Forest Service truck to drive in to town. Every nook and cranny that could hold dirt or water had moss growing out of it, and even the white paint had a greenish tinge to it in places, as the moss and lichen spread unhindered by sunlight or dry air. In my first three trips to Yakutat I never saw the place on a clear and sunny day, and had no idea how spectacular the mountains around it were. It was during my second year in Alaska that I managed to pass through on a clear day, and it was breathtaking. Above: The Yakutat airport on a sunny day. The airport was a kind of hub for the community in a few ways. First, it was where you came and went, and every time the Alaska Airlines jet came in there were always a few people milling around, waiting for someone or something to be offloaded. The airport was also home to one of the guiding outfits, and there was a small restaurant there too. But most unexpected, to me, was on the other side of the ramp from the airline terminal and restaurant. There was an old airplane hanger, looking like it was straight out of another era, with a small section of it turned into a fly-fishing shop. Scattered at random in the main hanger were the shells of several old airplanes in various states of repair, and it was the owners intent to turn it into a warbird museum. I don’t know if it ever became a reality, but it was still pretty cool to think of all those old airplanes from WW2 sitting in a hangar in the Alaskan wilds, waiting in perpetuity for visitors. It was also neat to see the vintage DC-3, complete with radial engines smoking every time they started, that flew in and out of Yakutat during the height of fishing season, taking supplies out to the remote fish camps along the coast from Icy Bay and the Copper River Delta all the way south to Dry Bay on the edge of Glacier Bay NP, and bringing tubs of salmon back to ship out to the markets and plants in the lower 48. There was a strange sense of timelessness up there, where the old and new collided, when a new Alaska Airlines 737 jet would be parked a few hundred yards away from a seventy year old, propeller-driven DC-3, and a pair of radial-engine de Havilland’s designed in the 1940s and 1950s. The hangar was also the site of the monthly farmers market. When I first heard about that, I initially thought that perhaps somewhere I hadn’t seen there was a thriving garden or farm. No such thing, as I later found out that once a month, or as they felt like it, a few folks would get together and order fresh fruits and veggies from the lower 48 and have them flown up from Seattle to resell in Yakutat. An innovative way to get your fresh veggies in a remote place. I suppose that this is as good a place as any to take a break from my Alaskan storytelling, although I’ve got more to write in the future. I’ve got stories about fighting fire around Fairbanks, about radio projects on the Kenai, and of course more stories about Southeast. I will say that one of the things I took away from living up there was a sense of the innovation and resiliency it takes to live in those places, even in the 21st century. I’ve read the accounts of fishermen who lived there in the 1970s and see similarities, things that simply hadn’t changed in 40 years. Reading the letters of John Muir, who traveled to Southeast several times in the late 1800s, I’d see the same kinds of weather, and the same difficulties in getting around from island to island. Living in a place like Southeast, even if only for a few years, changes a person. You see such a different way of life, up close and personal, that you can’t help but review your own life and experiences in a new light. After spending weeks at a time in places like Yakutat and Coffman Cove, I gained an increased appreciation of the small things in life, like a good cup of coffee, or being able to listen to the news on NPR. And I think that’s what I enjoyed most about living in Southeast, even if I occasionally hated it at the same time – it was such a harsh climate and such a remote and simple way of life that you had to take joy in the small things to stay mentally sound. I did, and I’m glad I was able to experience it. It was truly a once in a lifetime journey, and I wouldn’t trade it for anything. Sometimes I regret leaving when I did, but there is a season for everything in life, and my season had come to an end. I left with a wealth of experience, and many great memories, and that, I think, is enough.